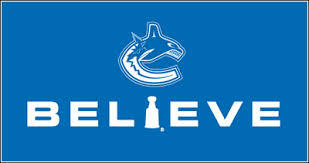 If you have been a long time fan of the Vancouver Canucks then you will be feeling this loss as well. So many great things being said about Quinn by players he used to coach. He had a way of making every player he coached believe they were great players. Greg Adams is one of these players I remember. I wonder how far Adams might have made it without Quinn as a mentor? Momesso, Sandlak and Geoff Courtnall the list could go on. Essentially average hockey players having the best brought out of them by a coach that believed in them and he made them believe in themselves. I would be lying if I told you a tear hasn’t fallen from my eye today. I also sort of wonder if Quinn wasn’t waiting to see Hansen finally get his first ever hat trick. 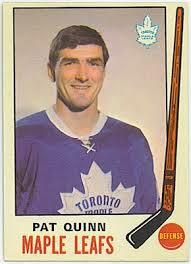 Pat Quinn was an aggressive defense-man in his playing days as it showed in his coaching style. He commanded so much respect from his players while at the same time returning respect earned. So much class in one man. So much knowledge of the game it is hard to say good-bye but fond memories will stay with us forever. There are so many fond memories in Vancouver, Toronto and on the international level it would be hard to tell you near all of them without turning this into a blog that has chapters. 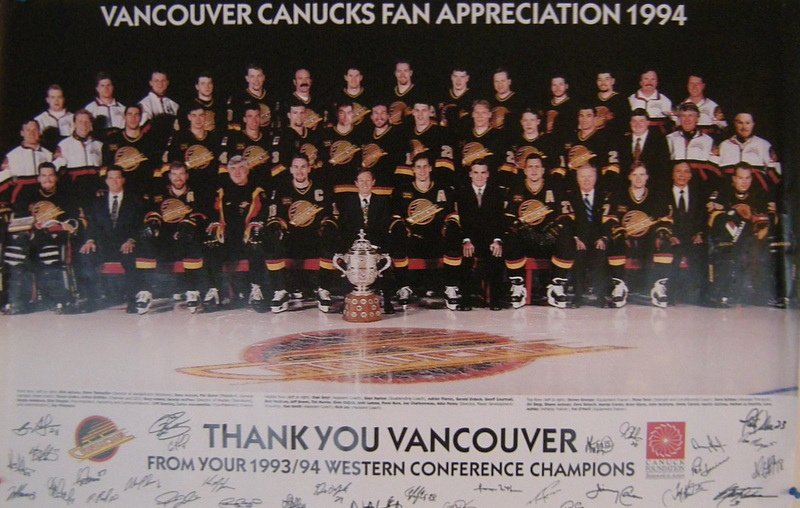 I know my fondest memory of Vancouver (I am sure many agree) is the 1994 playoff run that turned some light on the Vancouver Canucks that hasn’t gone completely dark for quite some time now. The fact they went seven games with the Mark Messier led New York Rangers was an accomplishment worthy of legend status in my mind alone and remember (I know you do) it was only one crossbar away from being more. 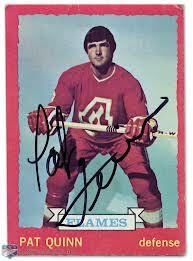 Pat Quinn coached 5 NHL teams LA, Philadelphia, Vancouver, Toronto and Edmonton getting to the Stanley Cup final twice, once in 1980 with the Philadelphia Flyers and again with the Vancouver Canucks in 1994. His overall record as coach in regular season play is 684 wins, 526 losses, 124 ties while in the playoffs his record is 94 wins and 89 losses as he led teams to 15 playoff appearances but the Cherished Silver Cup eluded him. On every International level Pat Quinn has won Gold coaching Team Canada during the Winter Olympics at Salt Lake City in 2002, the World Cup in 2004, IIHF U18 in 2008 and IIHF U20 in 2009. I always thought Gold was better than Silver anyway. As well as being coach (1991-1994,1996) of the Canucks Pat Quinn began his career in Vancouver as General Manager and President (1988-1997) and was the architect to the core of a past team whose heart still beats in the head office today. He made two real high profile drafts during his tenure in Vancouver including current team President Trevor Linden (the heart still beating) whom they drafted 2nd overall in the 1988 NHL entry draft and Pavel Bure whom they picked 113 overall in the 1989 NHL entry draft. That was an interesting scenario as Pat Quinn had intended to select Bure in the 8th round but upon hearing rumors that Edmonton was planning a similar move he decide to select Bure in the 6th round. 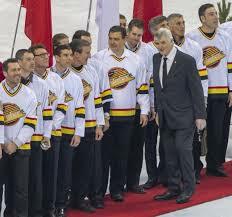 The selection was met with elevated displeasure from other team executives and found to be illegal but after an appeal the Canucks eventually got his rights on the eve of the 1990 NHL entry draft. 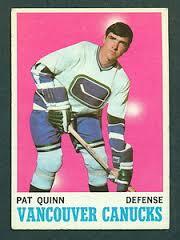 Pat Quinn also made a few high profile trades while he was GM of Vancouver. 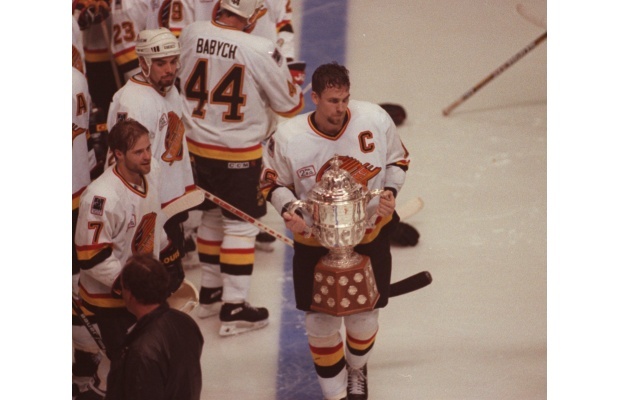 The most memorable were the ones leading up to 1994 Stanley Cup final run. One of them being with the New Jersey Devils in 1987 where the canucks gave the Devils F Patrick Sundstrom and a 3rd round pck in the 1988 draft in return for G Kirk Mclean and F Greg Adams. Another was in 1991 with the St Louis Blues where Vancouver gave up D Garth Butcher and F Dan Quinn for F Cliff Ronning, Geoff Courtnall, Sergio Momesso, D Robert Dirk and a 3rd round pick. Also in 1991 Quinn acquired 2nd round pick for the 1992 draft (which turned out to be Micheal Peca 40th overall) from The Boston Bruins for F Petri Skriko. On March 21st 1994 Pat Quinn gave up the rights to Craig Janney to St Louis for D Jeff Brown, Brett Hedican and F Nathan Lafayette. This last trade was probably the most significant to the Cup run in 1994. 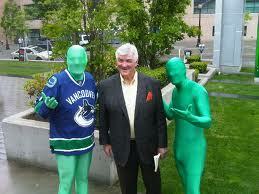 This entry was posted in ALL THINGS CANUCKS and tagged #PatQuinn #Memories #VancouverLovesYouPat. Bookmark the permalink.